Custom Shower Wall Panels – 5 Things Nobody Tells you that You need to Know! Custom shower wall panels are like a mysterious medical problem (note- I’m living this mystery right now as I’m in an Emergency Room Observation area while writing this post!). You’ve got to research, to poke around for the best options (while not necessarily accepting the first theory or product espoused from an “expert”). 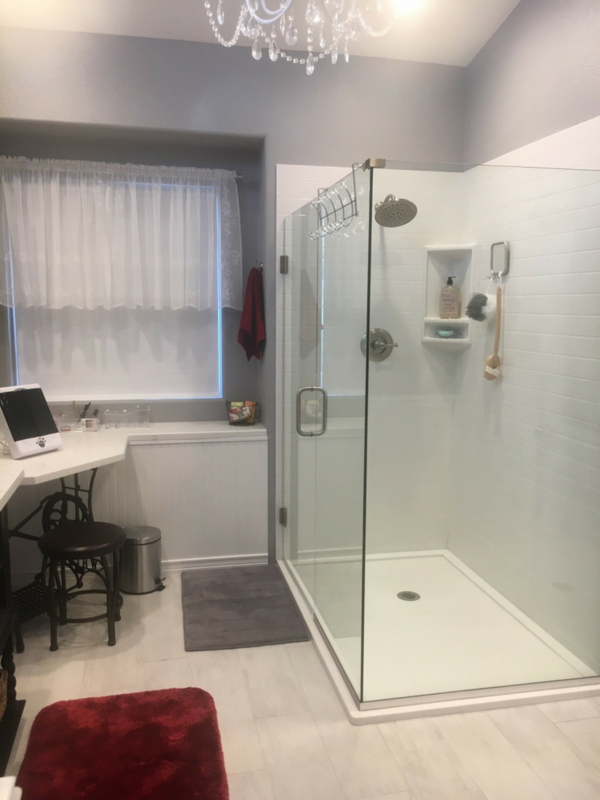 You want to find out not only what’s not good about your current custom shower (so you don’t repeat the same mistakes), but also what shower panel system will look nice and last down the road. You need to determine what options will fit your style and budget so you don’t have to deal with nasty tile grout or ugly, yellowed, and cheap fiberglass shower panels ever again. This research process can be painful. You’ll have to sift through the “baloney-ish” (not sure this is a word) sales pitches on company product web sites to find what’s right for you – not just what others want to sell you. 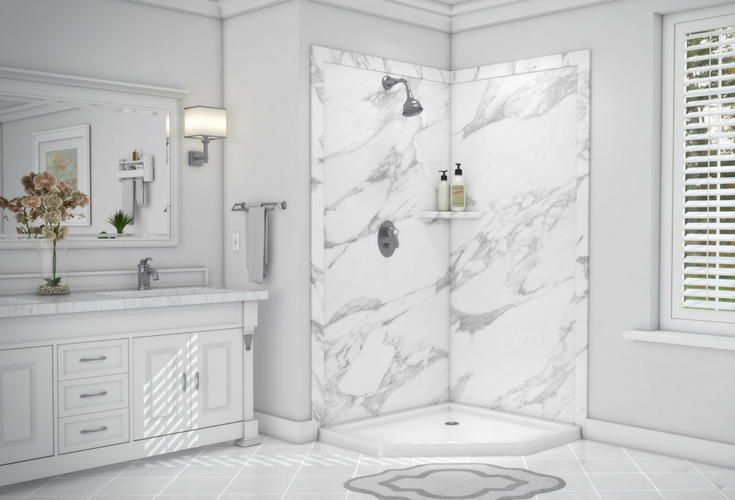 My goal with this article is to help you focus your research and find the right custom shower wall panels. I want to tell you simple untold truths to save you time and money. At the end of this article let me know how I did. 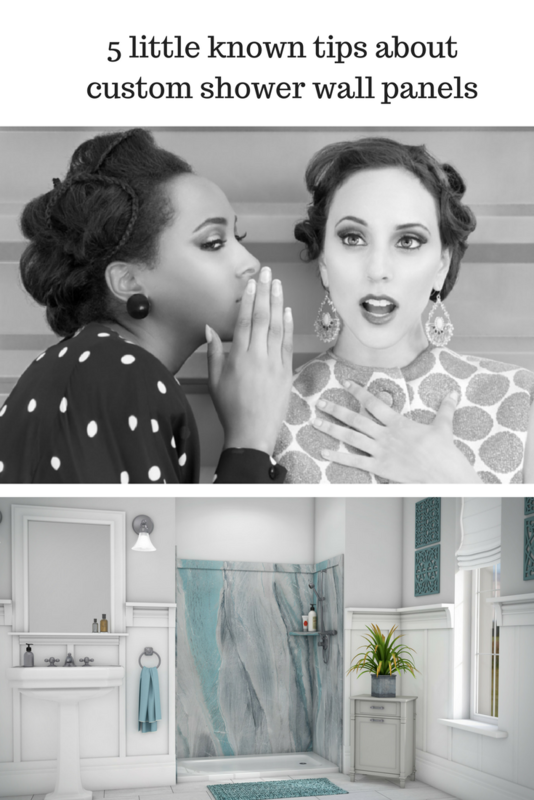 Without further delay let’s check out the 5 things nobody tells you about custom shower wall panels. I don’t have anything against home centers, but the reality is they specialize with in-stock products. Find it on the shelf, add it to your cart, pay and go. Some home centers do have custom order shower panels – but the real problem is “Freddie.” You know Freddie – he’s the fictitious – but helpful – new associate who was just awarded his bright orange smock 3 months ago. He’s trying to learn everything – but is still struggling to get his arms around the products stocked on the shelves – without even worrying yet about the custom order program. Do yourself a favor. Don’t waste time with home centers. Let your digitally savvy fingers lead you to people who are knowledgeable (and work daily) with custom or DIY shower wall panels. It will save you time running around town working with home centers “rookies” who try to help with a custom shower but really don’t know much. Use the convenience of your computer or mobile devise and Google companies who focus on custom panels each and every day. They will have more options and insight to get your job done right the first time. Two possibilities with these custom shower wall panels include the PVC composite panes and the laminated shower wall panels shown below. 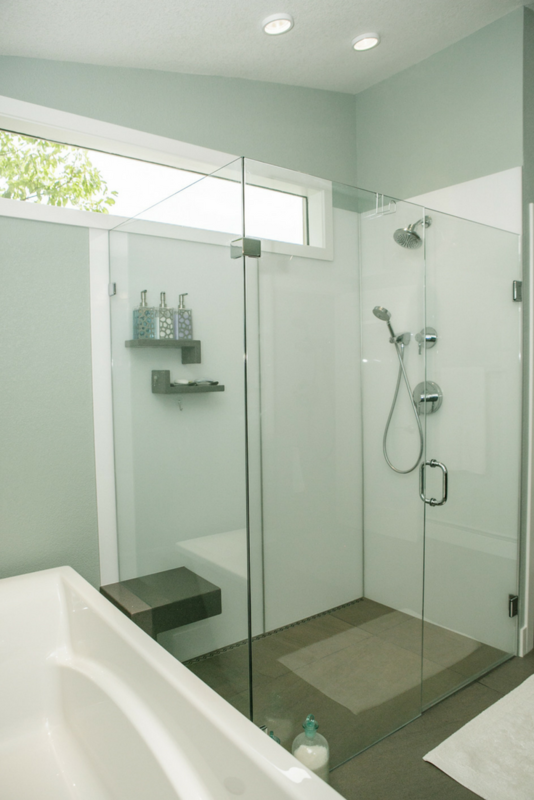 Tip #2 – Cheap custom shower wall panels don’t exist! Bummer…. So, you’ve gone to the home centers already and seen the standard 60 x 30 x 72 panels on sale for only $250 and thought, “cool – I can do this custom shower project and afford it too!” I’m sorry to be the guy to burst your bubble. The reason these panels cost $250 is they are mass produced. Then the big home center corporate buyers drive costs down by ruthlessly negotiating with the product manufacturers so they can buy them cheaply and sell them to you at a low price. The problem is your project has a custom size and shape. But don’t fret – there are cost effective options. Some cool – yet price effective – options you can choose to get ‘er done include PVC composite panels, solid surface and cultured marble and the laminated wall panels. From my experience, you can get a small 2 wall shower done for $700 to $900 or so, larger 3 wall system from $1,000 to $1,900. 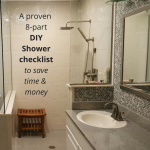 Yes – you can probably install your own simple tile shower for less money……. initially. 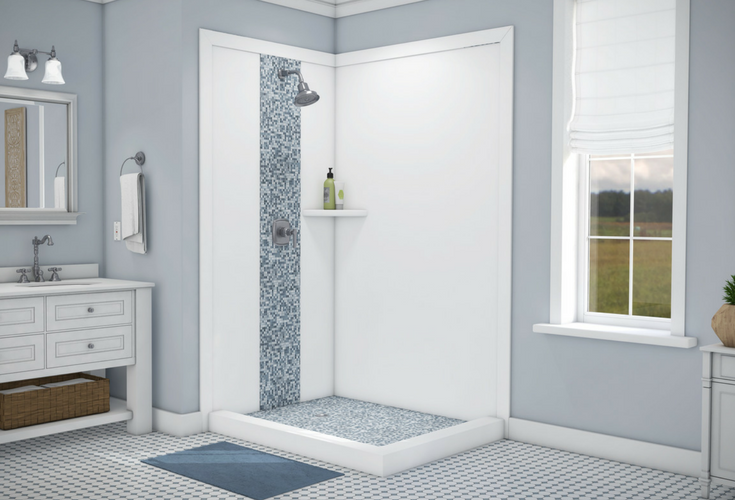 Eventually the costs of tile showers catch up and exceed the cost of custom shower panels. With tile, you’ll have the costs of re-grouting and maintenance hassle when your time is sucked up into cleaning tile joints (is this really how you want to spend your life???). Check out a picture of a cultured granite and laminated wall panel system below. 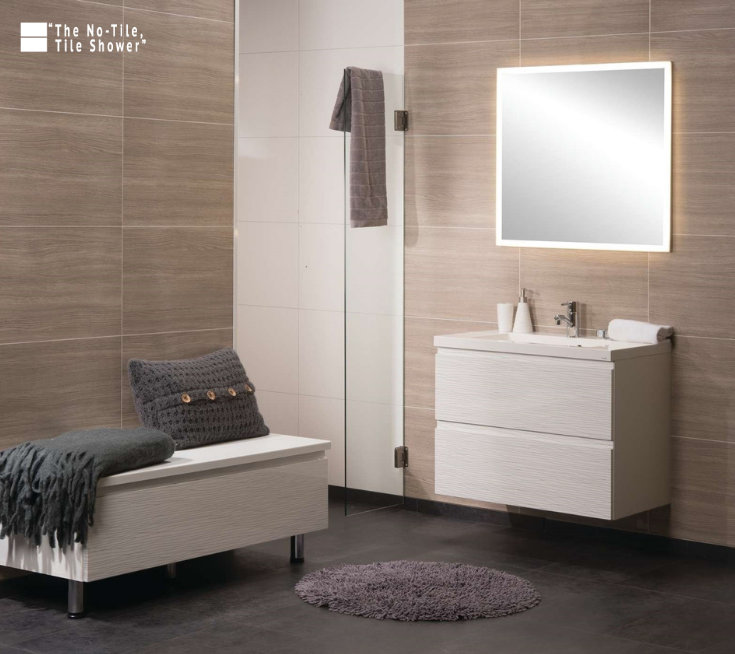 Tip #3 – You can buy really, really big shower wall panels with no seams, but are large panels a good idea? While size is impressive, if you talked to me I would likely advice you not to buy panels this big (despite the benefit of eliminating seams). Why you might ask? The simple answer is I doubt these large custom shower panels will fit through the door, up the stairs and around your hallway. When buying custom shower wall panels, we need to (as our elementary school teacher said) put our “thinking cap” on (hey – have you ever even seen a “thinking cap” before. If so – let me know I could use one of these from time to time!). 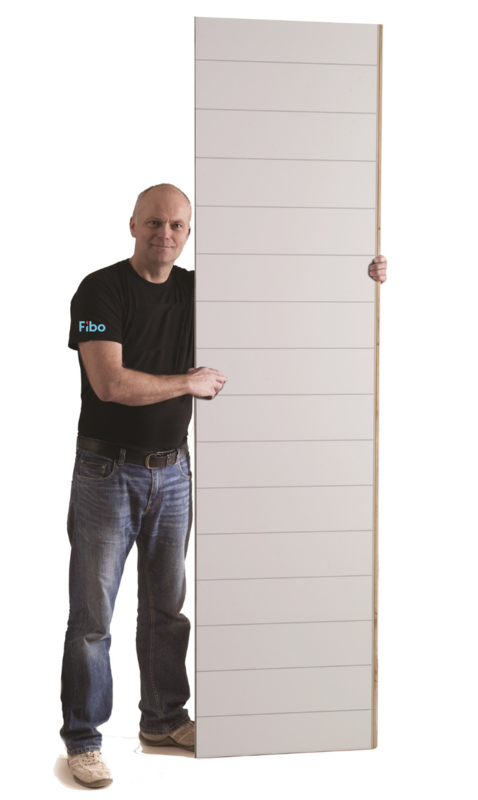 Think specifically how are you or your contractor are going to handle and install these wall panels? Will they be too hard to maneuver? How many people will be needed to cut and set the panel? If you do need a seam for a long or tall wall don’t fret. Just use a 3” to 6” wide piece of the same wall panel material to cover where two panels are joined together. It’s much simpler than trying to negotiate a big-old panel into your home. Note -the one exception to this could be in new construction – but even there you’d be forced to get the panel into the room before framing which is WAY before you would be able to install the panels. One option to make sure you don’t struggle with really, really big shower panels is to look for either lighter panels or those made in small sections with tongue and groove style installation systems. Once such system (the laminated panels) offer this tongue and groove approach (like laminated flooring) – yet are 100% waterproof. That sounds like a system to make things easier for you. I saw the coolest 3-dimensional shower wall panels the other day at the internationally-attended Kitchen and Bath Industry Show in Orlando. I was excited (this is my nature) and chatted up one of the guys staffing the booth. I could see these 3D panels become a hot seller for a sleek, minimalist contemporary home or urban loft. The guy explained what the material was made from, how it’s installed and also gave me some fun facts about his company’s history. All of this was fantastic, until he told me they only sold these wall panels in pallet quantities to hotel chains. My vision of an upscale unique new offering sold on a job by job basis (we cater mostly to homeowners and contractors doing smaller residential projects) was quickly dashed. Research tip #1 – Look at the pictures on the page – We all like to look at pretty pictures – but pay attention to the types of pictures on the web page you’re researching. If the images look like what you want in your home – continue reading. If these pics, on the other hand, show commercial projects hit the “go back” button. Research tip #2 – Ask, “How is your product sold?” – There are a lot of ways companies sell their products (direct to homeowners, through authorized dealers, through distributors who buy large quantities). Ask up front how you can buy their products. Are they readily available in the United States? No sense wasting your time (and the person on the other end of the line) if they don’t focus on your type of project (or you’ll need to buy it through a third party) or you can’t practically buy them for your one shower. Research tip #3 – Ask, “Do you offer installation? Is this product hard to install without prior experience?” A great product improperly installed is a bad product! 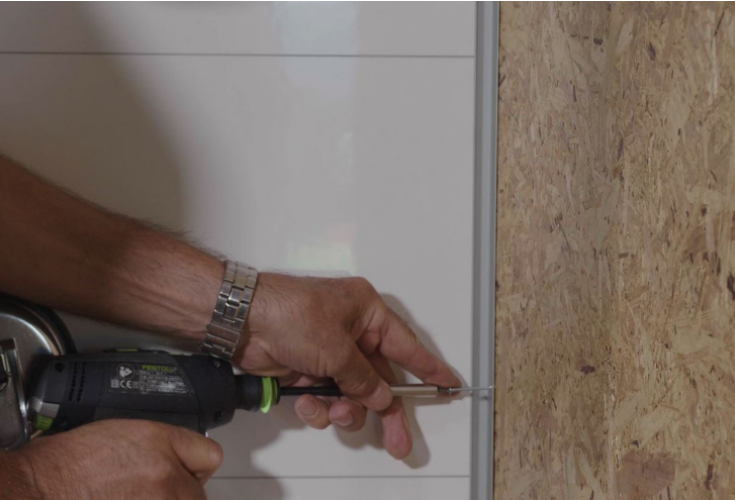 Make sure either you can (a) find an authorized installer in your city, (b) the product can easily be installed by a contractor who hasn’t done it before or (c) it’s DIY friendly and you can take it on yourself. Ask if there are any videos or instruction sheets available which show the install process. Have you ever brought a slick new toy home and painstakingly put it together for your son (who was chomping at the bit to start playing) and then saw those evil 3 words “batteries not included!” Ouch! This same frustration can occur with custom shower wall panels when you realize you found the perfect low maintenance high style walls but you can’t for the life of you find a shower pan to work with the panels. 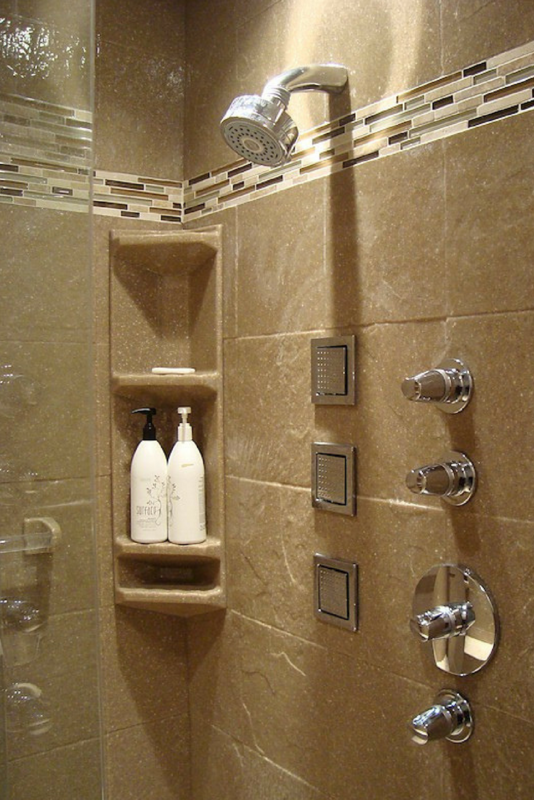 Since you need custom panels the options in shower pans become vastly more limited. If you want to match the panels exactly with the base perfectly one quality option is a solid surface or cultured marble shower pan. The other option, if you’d like some contrast, is to choose a shower pan which is understated in its design (like solid surface) and pair it up with a shower wall option which are contemporary and glossy, or ones with a lot of pattern (see two examples below). This glossy shower wall panel system can be combined with a solid surface shower pan. Patterned faux stone wall panels can be combined with low maintenance cultured marble shower pans. Researching and buying custom shower wall panels can be a daunting process – but it doesn’t have to be. First make sure you’re researching and talking to the right companies so you don’t waste your time. Go into the process with a realistic budget so you don’t start buying the panels only to find out you don’t have enough money to get everything you need to complete the work. Finally, make sure you can get a system which will work well together (pan, walls, accessories) so your shower will look and function the way you want it to. If you need help selecting, designing, or pricing a custom shower system to be shipped to you across the country or installed in your home in Cleveland or Columbus Ohio call the following numbers. For nationwide supply – contact Innovate Building Solutions – 877-668-5888.